Heat plus Strong wind + Dry grass = ??? 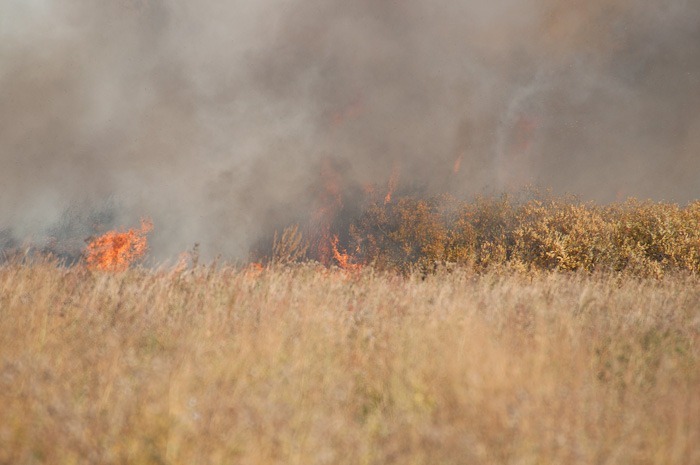 You got it, a grass fire. Grass fires look benign, nothing much to worry about, right? Wrong. 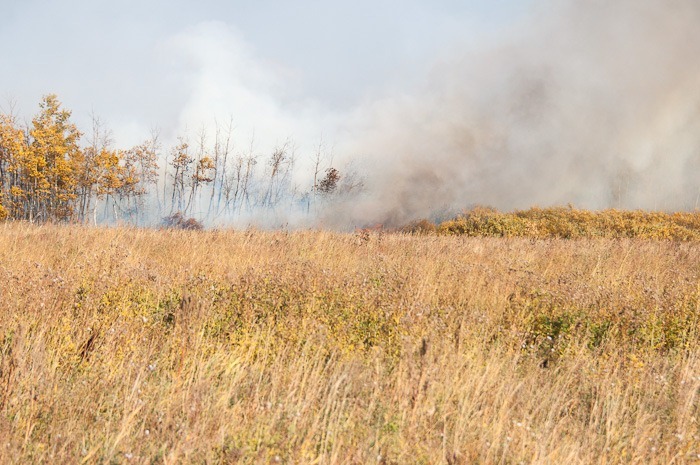 Grass fires can consume lots of other plants, trees and property along the way and still be named a grass fire. I came home from visiting a friend in Winnipeg. 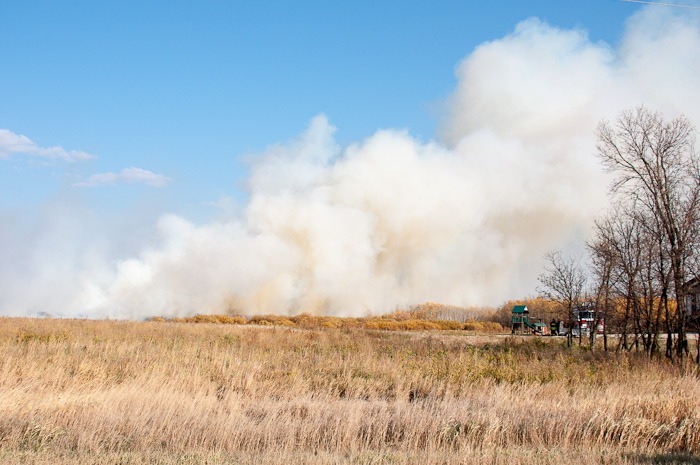 Driving through the Assiniboine Park, I saw big clouds of smoke and immediately thought that the Assiniboine Forest was on fire again, like a few months ago. 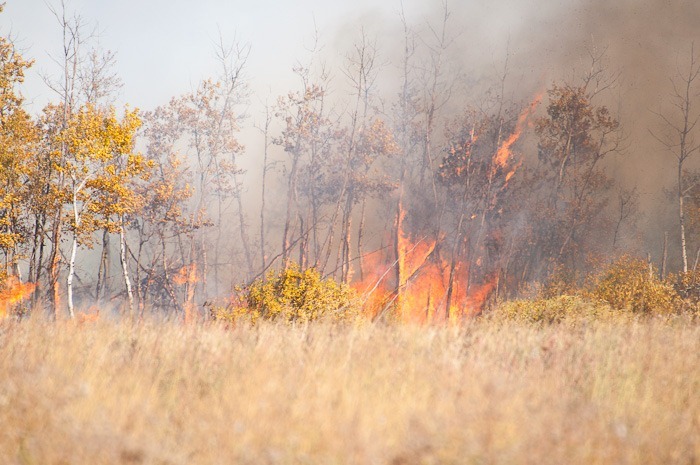 Getting closer to the forest, the smoke seemed to recede and finally I knew that the Assiniboine Forest was safe, at least for the day. Summer has been very hot and very dry. We have had no significant rain, as the weather people like to say. I’m not a rain fan, but I do see the necessity of it. And even from time to time I can appreciate walking in the rain. Singing in the rain would be considered an assault on everybody’s eardrums, so I leave that to others. 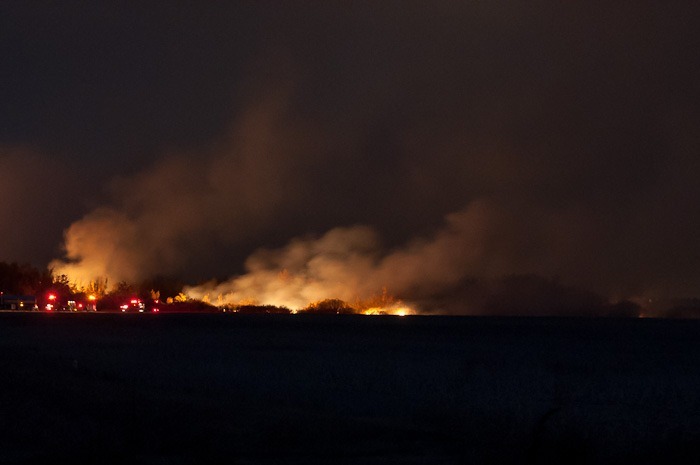 The fire was on Loudoun road, not far from my home and I decided to go and take a look. After all, I had my camera with me, might as well use it, eh? A few minutes after I passed what seemed to be the start of the fire, the road was blocked. No way to go back the way I had come. The fire seemed to have started behind the stables on Loudoun road. I watched it for a while, without seeing anything interesting to photograph. Of course I wanted flames and drama . Not exactly what you will find in a grass fire, right? Wrong again. 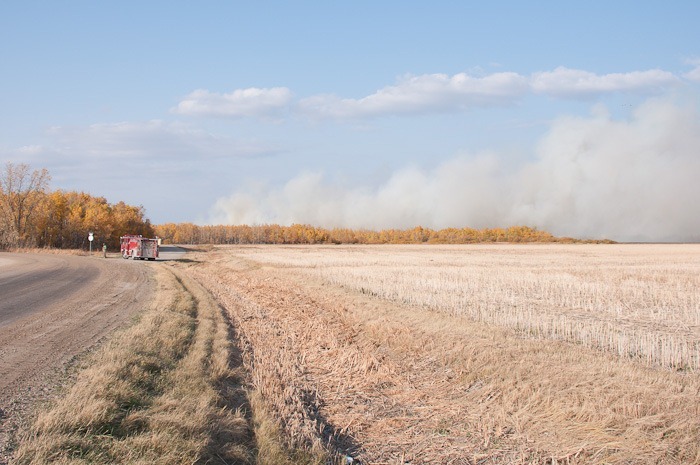 A grass fire can and will consume everything in its path and can create a lot of drama. Even more if that same grass has not been cut and removed from the fields for a long time. At least since the beginning of the year. 3 Feet high grass, dry as a tinderbox and ready to flame. And then: flames! Meters high flames. I was happy that I had my 300mm with me. 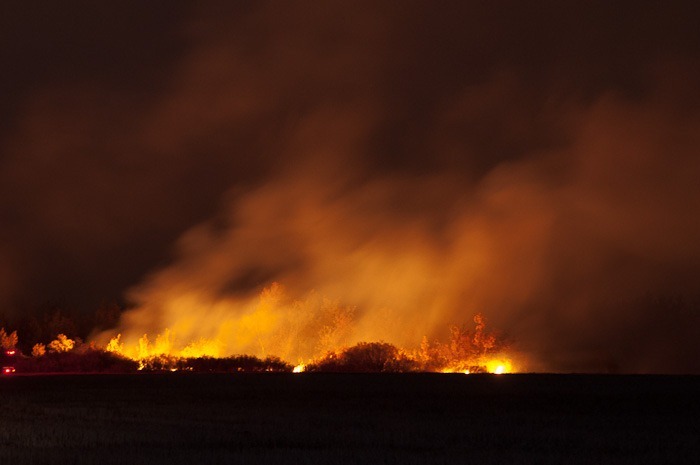 In April I had the “chance” to find myself inside the burning area, with flames all around me. This time I was happy to not be in the path of those flames. This was not a child’s bonfire anymore. 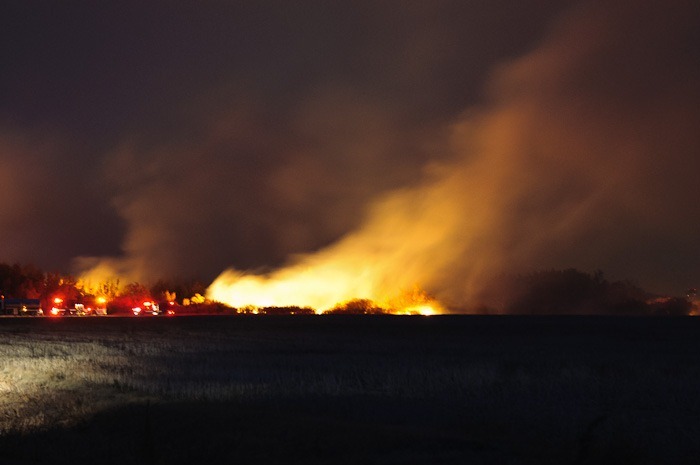 After a while, I wanted to get a different perspective on the fire but also feared for the health of nearby Fort Whyte Alive. The previous evening I had watched the thousands of geese spending the night in the lakes of the property. Today it looked as if Fort Whyte was doomed. Driving around the fire over McCreary Road showed that FWA was in no way in danger of burning. The geese, however, would not like the enormous quantity of smoke billowing over their resting place. From far away, it looked as if the fire was pretty small. 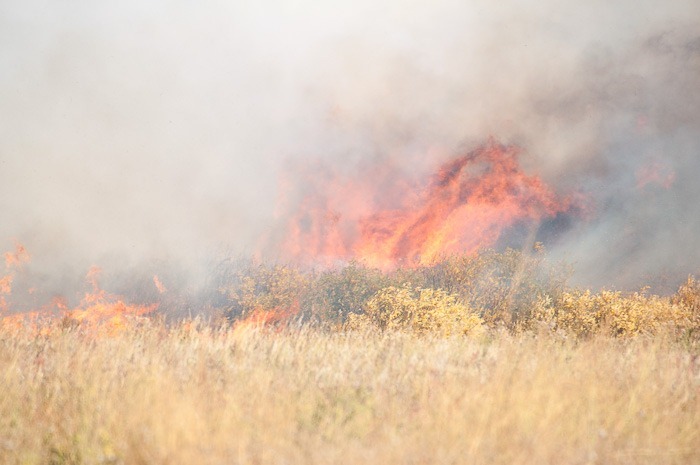 Hmmm, never underestimate a grass fire, it has many ways to continue to burn when a strong wind is involved. A closer, zoomed-in look showed that the fire was very much alive. Unlike my patience. I decided to go home, post a few pictures of the fire and let that be the end of it. But in the evening, I was thinking about it again when I heard more fire trucks going in the same direction. Back in my car, I got stopped in the beginning of Loudoun Road by a police car parked across the road. So I went back over McCreary and already from there I saw the flames and some smoke. By then the night had fallen. The view was even more spectacular than in the afternoon as you can see. The picture above was taken from approximately the same position as the previous picture in the afternoon. 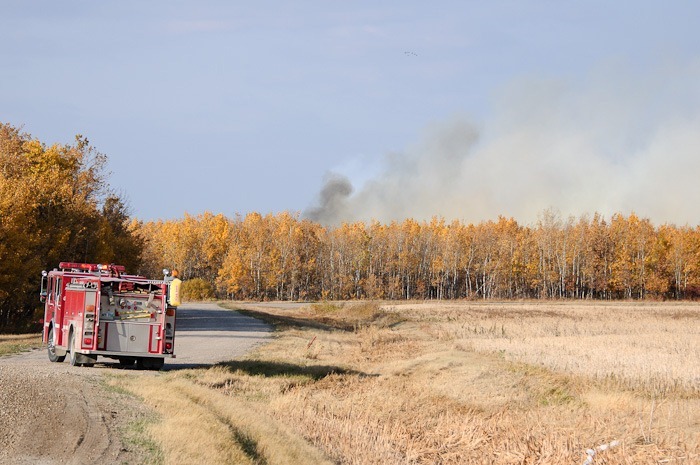 At this point, however, the fire had reached a cleared area where fire trucks and fire fighters could stop the fire. The road the fire had reached turned out not to be combustible. By that time it started raining, a rain full of smoke and ashes from the fire. Not a good place to be with a delicate camera. I decided to call it a night. The fire was soon to be vanquished. Leaving a black swath of ash and coal behind it. 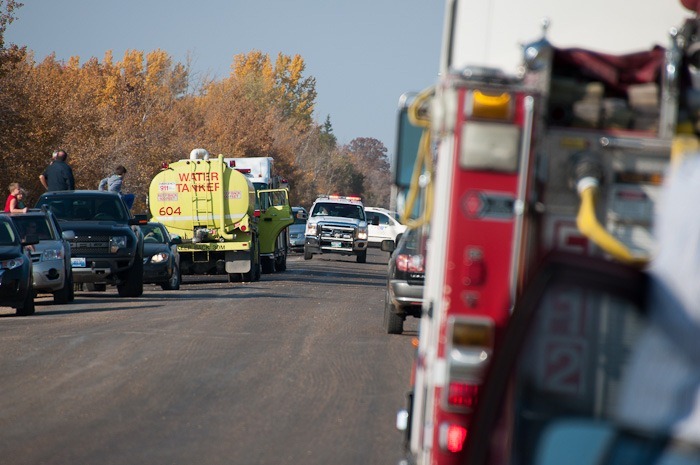 No property was lost, one property evacuated as a precaution and no lives were lost. All is well that ends well.